Here's The Skinny: An 'I-Will-If-You-Will' Book Club Primer on 'The Sandman' The next selection is "Sandman: Dream Country." It's Volume 3 of Neil Gaiman's groundbreaking comics series. Our comics blogger provides everything you need to know to get up to speed. So, it's done. The new book has been chosen, albeit only after a bout of shilly-shallying so epic it'd cause the Melancholy Dane to scowl impatiently at his Skagen wristwatch BUT NO MATTER. The new book is The Sandman: Dream Country. It's a comic. If you're having trouble dealing with that fact, you can go ahead and call it a graphic novel, we won't mind. Technically, however, it's not a novel, it's a collection of four short stories — four stand-alone issues from Neil Gaiman's groundbreaking, game-changing comic book series, The Sandman, which was published by DC/Vertigo from 1988 to 1996. The series, which ran to 75 issues, has been collected in various trade editions over the years. 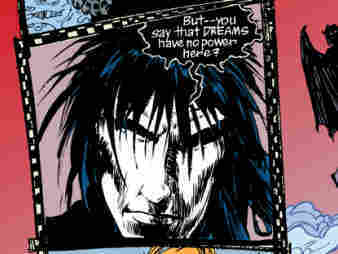 By that reckoning, Sandman: Dream Country, which collects issues 17 through 20 of the series' run, is Volume 3. Wha-huh?, you say. Volume 3? Of a long-running series? And we're just meant to ... read it? By itself? But how're we to know who's whom? And what's whatm? Don't we need to read the first two volumes in the series first? I mean, you could, and you'd likely come away with a slightly more nuanced understanding of what's going on. But only obliquely, and not necessarily. Understand that to those of us who were reading this series during its initial run, this four-issue interlude came out of nowhere. The book we'd been reading up to this point was in most respects a horror title that took place in a dimly lit corner of the DC Universe — the same reality inhabited by Superman, the Justice League, et al. Up to this point, Gaiman had told a couple long, multi-issue stories, and had begun to demonstrate that he had ambitious plans for his main character, and for the book. But then came these four stories, filled with characters we hadn't met, set in times and places that had nothing to do with the main series we'd been reading. 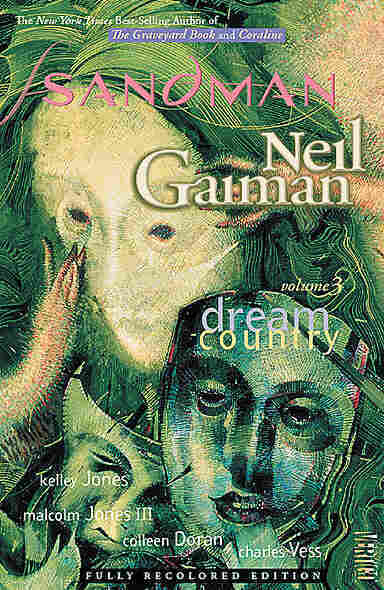 To us Sandman fans, Dream Country represents the series' pivot-point, the first time Gaiman takes a breath, rubs his hands together and really shows us how wide and deep the world he's creating for this series truly is. The horror trappings start to fall away, along with the superhero stuff, and the title begins to concern itself with the myths and magic underneath it all. So, no. You don't have to read the first two books beforehand, and I think it'll be an interesting experiment if you don't. But if you really really you want to, or your OCD demands it, you should of course feel free. There's This Guy. Named Dream. A.k.a Morpheus, the King of Dreams. He's an immortal, one of the most powerful beings in the universe, with many different names and guises. But don't take that "King of Dreams" business too literally: Yes, his domain includes your nightly, ohmigod-I'm-naked-on-The-Price-is-Right-and-Drew-Carey's-my-old-algebra-teacher! reveries. But in a larger sense, his realm (called "The Dreaming") is where stories come from. All stories. Every story. Every story ever told, and many that never were: the stories we tell one another to comfort, terrify and/or amuse, to try to make sense of the universe, and the stories we only tell to ourselves. Grad students would call his bailiwick "narrative," kindergarten teachers would call it "imagination." Not What You'd Call a Joiner, This Guy. To be fair, he's had a rough go of it, over the past 100 years. Lost his kingdom, his power, and had to gain it all back, piece by piece. But that's not what's got him down. He's always been sort of aloof and mopey. You would be too, if you had his family. It's not good for people like him to fall in love with people like us. Never ends well. As you'll see. And that's ... pretty much it, really. I envy those of you getting to enter this universe for the first time, and look forward to talking it over with you. Now, for the extra-credit grubbers among you, I'll note that it's possible the four individual stories in Dream Country contain references to things you might want to bone up on, but to say what they are could be considered mildly spoilery, so I'll bury them after the jump. Click, if ye be insouciant about that kind of thing. The first story, called "Calliope" is pretty self-explanatory. Plus, finding out what's going on to the titular character, and who she is, is part of the (very dark) fun. So, yeah. Moving on. The second story, "A Dream of a Thousand Cats" is also self-contained, though its themes are pretty much the themes of the whole damn series. The cat-fanciers among you will dig it, hard. The third story, "A Midsummer Night's Dream" is about ... Shakespeare's A Midsummer Night's Dream. You can't tell the players (snerk) without a scorecard, and there's a hell of a lot of them, so you'll want to at least cursorily review the play's broad-strokes plot outline. The final story, "Facade," is about a bit player in the DC Universe, a superhero called Element Girl, who was in turn the female version of C-lister superhero Metamorpho. Like him, she was transformed by the ancient Egyptian artifact called The Orb of Ra into a freakish-looking creature who can will herself to become any element. If it turns out that Sandman: Dream Country is your first comic, here's a word of advice: Slow down. Take your time. Those new to the medium tend to carry their prose-sensibility with them. Unless you're careful, you'll likely find yourself tearing through the pages, devouring the words and only occasionally glancing at the art to orient yourself on who's saying what. It's easy to do, especially if you've been conditioned by the relatively static panel-to-panel progressions of many newspaper comic strips. But you're not reading a prose novel. Comics are a medium of words and art, and Gaiman and his artists like to create tension between text and image, allowing action and body language to intensify or undermine what a character is saying. If you go too fast, you'll miss it. So relax. Look around. Check out the backgrounds. It's all there for a reason. When you're done, you can check out Gaiman's witty and thoughtful script for "Facade," which is included in the book's back matter. It's a fascinating glimpse of how a comics writer talks to his artist about mood, panel placement, character interaction, sound effects, everything. For now, though, get the book. Linda will let y'all know when we'll get started. Can't wait. PS: The "Here's the Skinny" in the title of this post is meant as something in the order of a joke. Because Morpheus is. Uh. Thin. And, you know: Here he is.